Thanks Loren. I did a quick 15-minute ride yesterday and the codes have not come back yet. Well they had to replace the shifter rod as one end had disintegrated (hence the disconnection of the linkage), the other end was in bad shape. Total repair was $800. I decided to send the car to my mechanic to fix the ball & Socket issue as I live in a condo I don't have garage space to do the repairs. Thank goodness for AAA as is no cost to send the car to the mechanic via flatbed. Does anyone want to hazard a guess what the mechanic bill will be? Thanks for the heads up., I will let you know how it all turns out. Hi JFP - Thanks for the reply, that makes sense based on how the transmission feels. However, upon further investigation, I thought that the 993s had shift rods, not cables? It is a 1998 993 if that helps? I have a 1998 Carrera Manual Transmission Cabriolet with 22K miles that I have owned for the past year. Been a fantastic car with no issues up until yesterday. Just took it out for a two hour highway run on Sunday morning. As I was reversing the car into my parking spot, I heard a metallic noise (not unusually loud, as the transmission does have a mechanical sound to it - in which I do love). From that moment on, it felt as if there was no connection to the transmission (cannot feel the H pattern). The car is stuck in Neutral and I am not able to put it into or find any gears. I turned it off and started it - but the same problem. The transmission feels the same with the car off as it does when it is on. The clutch feels the same as it always has. Any ideas of what I am dealing with here? Pre-purchase inspection recommendation in LA? Thanks for the reply!! I am heavily leaning to getting it done (assuming I can find someone local who I trust to do it). My brother (who is the mechanic in the family) sent me the following video of a person in the UK who converted his 996 stock exhaust with a bypass from the inlet to the outlet pipes. It claims that it is what Porsche has done with the sports exhaust option that was available on the 996 (though with the Porsche option you can turn it off/on) https://www.yahoo.com/news/simple-exhaust-modification-gives-996-212015583.html I have a 2004 911 Cabriolet and was thinking of doing the mod to my car, though I am a bit concerned that it may be a bit too loud. As I live in Florida, I try to drive with the top down as much as possible. Two quick questions to the forum: Does anyone have any personal experience with the sports exhaust option on their cabriolet? Specifically do you keep it turned on/off most of the time and does it depend on whether you have drive with the top up/down? Anyone done the hack in the video and are there any gotchas I need to be aware of? I appreciate any feedback. I just got my book from Amazon on Wednesday of this week. Since I am Amazon Prime I get shipments in two days, so if you are not prime expect yours to arrive any day now. Just looked at it briefly and am very impressed with what I have read so far!! roadsession - Thanks so much for the advice. Just got back from my road trip on the 25th to NYC and back. A couple of observations on my trip: I took Florida Turnpike/75/85 and just a bit of 95 from outside of Richmond to NYC. Stayed off of 95 as much as possible which was easy since I broke up the trip by staying in Atlanta with friends. The time of day/night you travel makes all the difference. TIming so you stay away from rush hour while going through major cities is key. Florida as the best public rest areas. When I was in college, you had to make sure when driving at night that gas stations were open. That is not the case anymore, you can always find gas and places to eat no matter the time of day.. Cops were only bad on the last segment of my trip from Atlanta to Orlando to Miami. The rest of the way was smooth sailing. Typically drove around 85-100mph. Gas mileage was about 23 mpg Wow was it cold this trip. Especially in NYC the week after New Years. Parking a 911 cabriolet on the streets of NYC overnight is no problem. I parked my car there for almost three weeks (alternate side of the street was suspended half the time due to snow/cold) and no issue. Maryland is the worse state for people not getting out of the left lane. Florida is a close second. Lots of people get pissed when you pass them going 100 mph after giving them a quick flick of the high beams while approaching. I figured it was like a European vacation for them as it was like they were driving the Autobahn/Autostrata :) Gas is super cheap in South Carolina. Waffle House in the deep south is a cultural experience that one has to partake on a semi-annual basis. Plus they all have internet juke boxes so you can make friends with the locals by playing a Tom Petty song and the TLC song "Creep". You see very few high end cars on the highway. I can count on one hand the number of Porsche's I saw while driving the entire trip. My Valentine unit was throwing a ton of false positives. I guess that it is due to the traffic sensors that are getting installed on most major interstates. I really need to upgrade my unit Spotify is fantastic for long trips. I bought the new Bose i20 in the ear noise reducing headphones and used them on my ipad while also running Waze in the background along with Google maps. Saved my *** a number of times with traffic and cops shooting radar. I used my summer Continental tires for the trip which was probably not a smart idea, however I missed all the snow/ice while driving. I ended up having to put about 5-6 psi in all the tires after the first half of the trip. I guess I attribute it to the cold. There are some serious pot holes in the northeast, fortunately I missed the vast majority of them :) My dogs were amazing the entire trip. They slept in the passenger footwell the entire time when driving and were a big hit no matter where I took them. In summary, I would do the trip again. Was a blast driving at night listening to music all in the comfort/performance of the best engineered car in the world. I decided to make a road trip from MIami to NYC with stops along the way this holiday season in my 2004 Cabriolet (BLack/BLack with 43K miles). 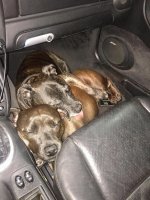 Going to pack my cold weather clothes, put the two English Staffys in the passenger footwell (see enclosed picture), fire up the Valentine along with Google maps and head north on Boxing Day then back down again in mid January. Are there any cold weather pre-trip maintenance that I should be thinking of? I am going to be visiting my brother in Baltimore where we are going to put on new brake pads and change the oil (having an brother with practical mechanical instincts is a blessing when one owns older German cars), so we can do some of the stuff there, otherwise I can have my mechanic do it for me prior to my trip. Any advice/insight would be appreciated. I will send some pictures along the way. The two Staffys have service dog tags so I am sure that there will be some memorable moments along the way. Hope you all have a great holiday!! No, thank you very much!!! New warning lights/Durametric codes - Should I be worried?